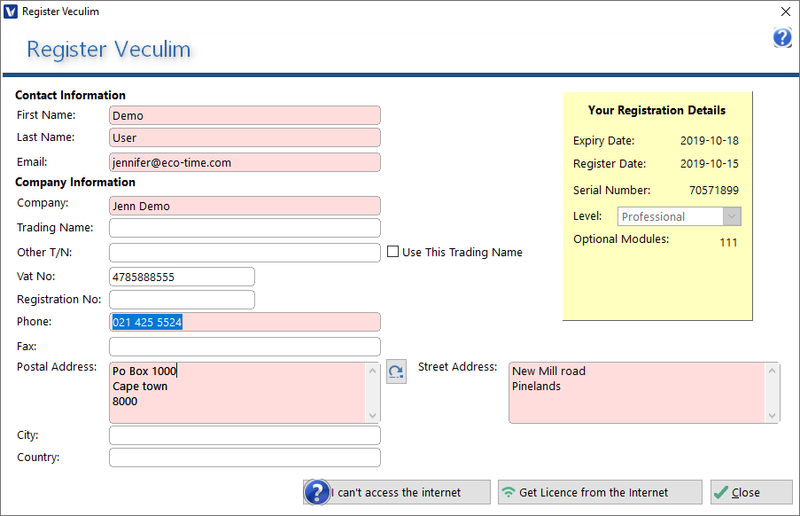 A registration note will appear when running the software for the first time, when your licence expires or when you don't have a valid licence. You can also access this window manually at any time via the Security Menu using the Product Registration button. Once the Registration window is displayed, please fill in all information. This information is used on your quotes and invoices, so it's important that it is completed accurately. Once you have entered all the necessary information, click the Get Licence from the Internet button. Note: Should you not have Internet access at the time of registration, please click on the I can't access the internet button. This action will register the software and apply the new activation code, upon which Veculim will automatically restart thereafter enabling you to use the functionality that the licence permits. Note: The licence level is controlled by CapeSoft. You may email a request for a level higher than a demo licence (i.e. the automatic Lite licence issued) to sales@veculim.com. You have a one time licence request available to enable you to get going with the Lite version. Thereafter, CapeSoft will need to activate your licence in order for further licence requests to be successful.